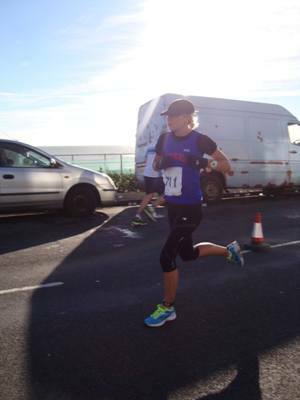 Although my Brighton 10k run was not my finest I discovered on Monday that I had used up all my motivation and mental strength. Actually it was probably the 5k on the Sasturday that used it up. Anyway I gave up after the first few reps at track. This goes to show the bad state of my mind as usually I love track and would never give up.Tsk. Oh well. Still ran 5.5 miles but it became a recovery jog rather than an interval session. Luckily Holly had also given up so we took solace in our givingupitude together and Rob was injured so I jogged about disconsolately with him for a bit too. Tuesday was the usual mix of Core & Stretch in the morning and kettlebells in the evening. Jenny said my downward dog has improved. Unfortunately as I was 100% bilge to start with means I am still at least 90% inflexible now but still progress is progress. Back in the evening for kettlebells. I wasn’t so bad at this (apart from the bits I can’t do due to dodgy inflexible yet totally unstable shoulders). I found myself doing proper squats – bum to floor – with a 16kg bell. Hmm, where did that come from? Not the weight but actually being able to get bum to floor without overbalancing. Success! On Wednesday I had plans to get a LSR in early but the weather was conspiring against me so by late afternoon I decided I might as well tack some extra miles on to the front of the usual A80 seafront run. My fellow Giver-Upper from Monday, Holly, was struggling to find motivation to go out too so we (and Rob) wrote on Facebook we would be there so we thus had to be. This worked spiffingly and as I was out on my pre-run 6.5 miles I saw Holly zooming past in the opposite direction thinking she was late and picked up Rob as I made my way to the start from an unusual (for me, not in general) direction. After completing the Arena run and carrying on home I notched up 13.5 miles which is good seeing as my long runs had fallen by the wayside a bit due to races spoiling my routine (I was trying to be sensible and taper). Naturally having managed a long run the day before Andy then wanted to do one on Thursday. He is rather too fast for me at the best of times and once Rob had bailed out after 5 miles due to injury I struggled, especially towards the end where he dashed ahead (though he did keep looping back for me politely), but it wasn’t surprising especially as I found I had done over 16 miles by the time I got home. So from no long runs to 30 miles in less than 24 hours. Oops! Luckily for me the gym had suffered a serious burst water main in reception so there was no spin on Friday so I was able to have a day off (yes, yes I know I should be able to have a day off under my own steam but I really struggle). 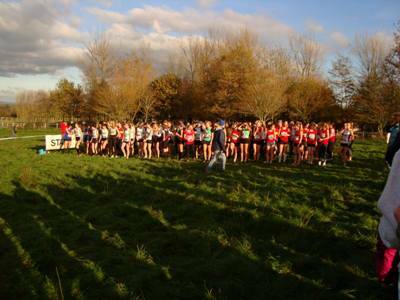 This was extra fortuitous as I knew that the hell that is Plumpton xc was looming on Saturday afternoon. I hate this race with a passion and knew I would be awful as always and just be a sulking goit throughout. I was. I started off OK but then just completely gave up and huffed home like a spoilt brat. Thanks Danny for the photos. Thank God there are 364 days until the next one! 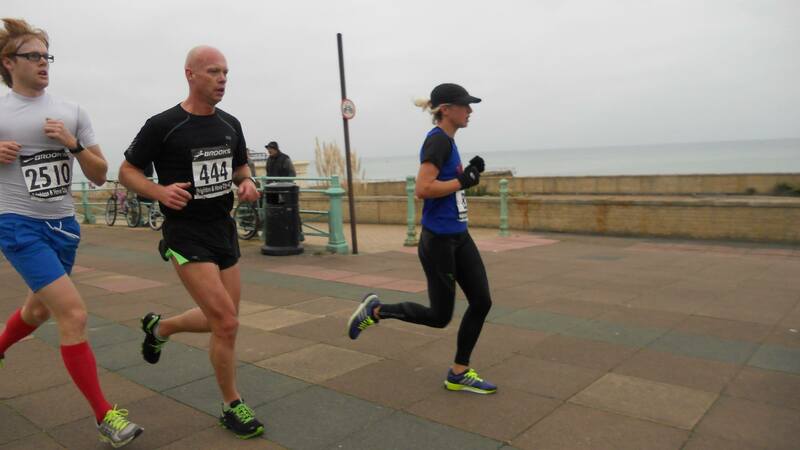 This morning it was the first of the RunBrighton marathon training runs. As I am not doing the marathon these will help me prepare for the Brighton Half where I am supposed to be running sub 1hr 30 along with Rob. Today we decided to jog out then run back at half pace as it was a flat(ish) seafront run in perfect conditions. This we did. Alas as I didn’t know this was the plan beforehand I had not inhaled (I was anticipating a slow recovery run) so sounded like a massive wheezing goon on the way back. Apart from sounding like I was about to expire we comfortably ran around 7 minute miling which is near enough pace (I think we need 6.52s for sub 1.30) especially as we are still 3 months out from race day. Obviously it was only 3 miles or so but I feel it is a good start as it is always easier to run faster during a race so if we can keep this up in training for longer stretches then I think come the actual race we should be fully ready and prepared for the slaying of the 90 minute barrier. I am hoping having not raced this weekend (sorry Plumpton) that I might be able to actually complete the track session tomorrow with no sulking and general giving up. Monday brought with it the promise of track which is always a good thing so off I skipped merrily not thinking of Bexhill half the day before. The session was 8 x 800 to be run as follows 700t 100f, 500t 300f , 300t 500f, 100t 700f, 600t 200f, 400t 400f, 200t 600f, 800f. Somehow I ended up running with Dan for most of it. He was taking it easy having just run a marathon but he left me after a while and I gained Rick and Rob from the group behind. I felt OK for the session though perhaps I was a little slower than I would have been if there had been no Bexhill the day before. On Tuesday I went to Core & Stretch and kettlebells as Jenny and Matt were back. Having only missed a week I was even worse than usual at C&S. Kettlebells was fine though I still can’t do various things due to massive shoulder instability so I got quite annoyed with myself (again). A nice steady 8.5 miles on Wednesday evening with the Arena posse and a temperamental Garmin (peer pressure when Rob’s Garmin stopped). Contrary to expectations I managed to have Thursday and Friday off as I still felt tired and generally mojo-less. I gave myself a good talking to and decided to go to Preston Park parkrun on Saturday to try and break my awful streak of runs at Hove Park. I’ve done about 160 parkruns there and also train there on Thursdays so just arriving there on a Saturday morning makes me slump with not-this-AGAINness. I arrived bright and early so I would have time to give my new Boosts a test jog (and my new leggings-that-actually-reach-the-ankle). 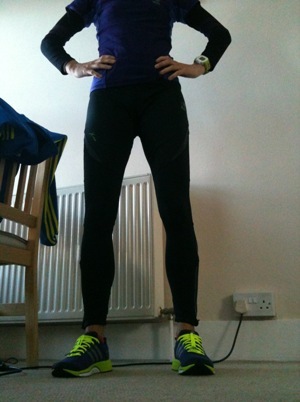 New leggings and Boosts – a speedy parkrun combination? This I did and discovered I needed to tighten the laces massively due to the stretchy slipperesque upper. It was nice as we toed the line to see only 150 or so runners and a downhill start. Rick and Duncan where there and I knew they were 20.30 ish runners so I decided to try and keep with/ahead of them as much as possible. I set of way too fast as always (easier at Preston Park as a much less congested start) and passed 1k in 3.43 – oops. Never mind. At some point around 3k Rick and Duncan caught me up and we spent the rest of the race swapping back and forth amongst the three of us which was helpful for me to keep going. As we neared the finish Duncan and Rick were just ahead but after vaulting a dog I managed to overtake Rick and finish a few seconds behind Duncan in 20.16 which is my best 5k time for ages. I felt pretty strong but relaxed during this run and having Duncan and Rick there made it seem like more of a race which in this instance was very helpful. 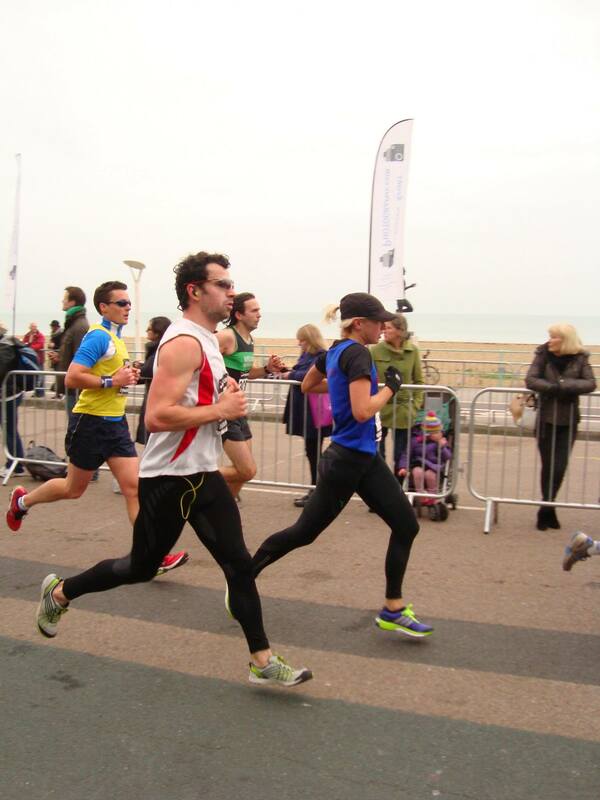 The Brighton 10k was on Sunday. I don’t know why I persist in entering this race as I hate it as it is way too crowded and causes massive anxiety and pavement rage which hinders breathing for the first few k. This happened. I also forgot when I reached 5k that it took 30 seconds to cross the start line so the clock saying 21 minutes wasn’t actually my 5k time. I still managed to lose 45 seconds in the last 5k and finished in a not very good 41.45. Nothing much to say about this. I was happy with my parkrun on Saturday so will forget about Sunday. On an unrelated matter here is a marvellous remix of Fat Boy Slim especially for runners. Thanks to Rob for the production and well done me for recording myself which was the most anxiety and humiliation inducing thing ever. I then managed to get hold of my sense and DID NO EXERCISE AT ALL until Saturday when I decided I needed to do a mini run just to remind myself how to run as I always find after resting I can’t run like a normo and I wished to get this out of my system before Poppy Half on Sunday. I went along to Hove Park to volunteer at parkrun the took myself out for a little 3 mile half marathon pace run in the wettest conditions known to man. It felt really hard to run at 7.15 pace which was exactly why I wanted to do this run as I knew I then wouldn’t feel like this is the first few miles of Poppy. Finally, and not a moment too soon as I was going mad through exercise withdrawal, Sunday rolled around. It was a beautiful sunny but cold day. Emily had kindly offered to give Dani, Rob and I a lift so we set off bright and early in matching socks (this was unplanned but goes to show Arenas RULE). After a bit of to-ing and fro-ing in the car due to unclear instructions as to where the start actually was this year we found race time was upon us. I was totally and completely not in any way nervous. I didn’t know if this would be help or hindrance but there was no time to ponder this as we were off! Somehow we had funnelled in at the last minute right to the start line so I started my watch sensibly as I crossed the chip mat unlike the past races where I have started it at some indiscriminate point between the gun and crossing the mat. I had printed a sub 1.35 pace band a la Windsor but I didn’t even look at it. I only looked at my watch as it beeped at each mile and was consistently under 7.15 minute miling (1.35 pace) so knew I was on track. Of course as I reached 9 or so miles it all went a bit wrong but I felt I was still just about on the cusp of acceptability. This was confirmed when Rob passed me telling me I was still well under target. 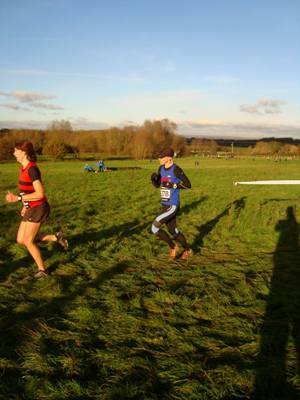 I then passed him again not long afterwards as he had stopped at the water station (naughty). There was no water for me though (they were nonchalantly pouring it as many parched runners sped past) so I ploughed onwards. Being mathematically challenged at the best of times I had somehow worked out I was outside my target time but managed to talk myself into still trying and then discovered that actually I was still just about on pace. This being a 4 lap race I knew exactly where I was and how far I had to go and finally the end was in sight. I put in a fastish finish and crossed the line in 1.34.48 (my time). Thank God for that! Seeing as I was in no way motivated for this race and had stupid bum pain as usual I should be pleased with this run. Imagine what I could do if I really cared and had two fully functioning legs? One day I hope to regain a racing mindset so when that happens perhaps I can reach the elusive 1.29.59 then retire. My official time was 1.34.46 (gun), 1.34.43 (chip), 7th woman out of 299 and 75th out of 774 over all. The main thing is I ran and have (hopefully) saved my brain from imploding into a mulch of non-exercise induced doom and gloom. Until of course I do too much again which has the same mental fate. A grand total of 24 miles for the week and no other exercise. I am sure I shall ruin any benefits I gleaned from the rest by going all out mad this coming week. Traaaaaaaaaack! 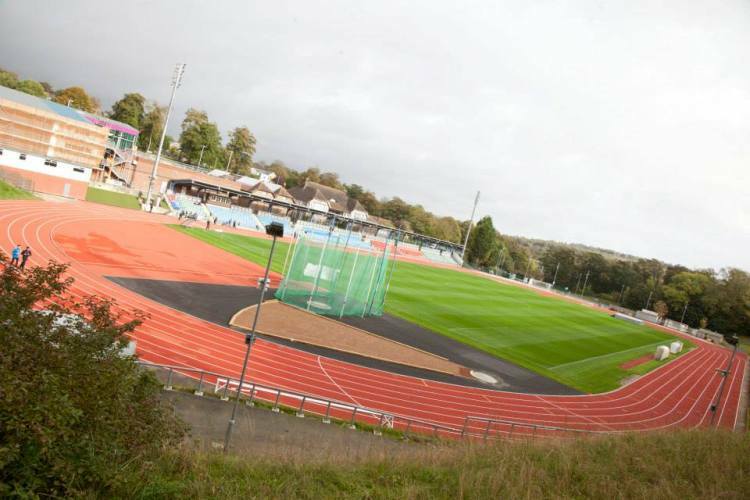 I love track more than anything and it had been a long old wait for it to re-laid but finally we were back there for Monday’s session. Although I have been quite slow recently I decided to get straight back on it in Caroline’s group. I know that I am better suited to track reps than most of the Arenas who are mainly endurance runners so should easily be able to keep with Caroline for shorter stuff. Bob showed no mercy that we’d been track-free for so long and set us 8 x 800, adding a further 10 metres each rep, but to be run in the same time each rep. As always my plan was to stick with Caroline as much as I could throughout to stop myself from doing the first reps too fast and petering out towards the end. This I did, made much easier as we had a static 75 second rest between in each rep (everyone tends to get away from me when it is a recovery jog). I was most pleased that I managed to keep with Caroline (ish) all the way until rep 7 where she pulled away (or rather I flagged). Previously I would have only kept with her for maybe 4 reps so good improvement. I very much enjoyed the session and was ready to do it all again as soon as we finished! It is amazing how mach better I run just because I enjoy it. Well no amazing at all of course but I need to remember it is supposed to be enjoyable and not much has been recently and I have been crap in consequence. I realised later that the reps were actually longer than 800 +10 as we were running in lanes 3 and 4 (a stupid post-relaying rule – no running in lanes 1 and 2 [there I was thinking it was a running track]). Anyway it doesn’t matter how far we ran I was very pleased with my running and was just happy to be back on track where I belong. Having done a mile warm up jog and a mile cool down I had a nice sturdy 7 miles for the bank. As last Sunday was a bit of a rowing and treadmill bumkill overdose I decided not to do any rowing on Tuesday and just stick to the normal Core & Stretch and kettlebells. My forearms would be pleased too as they were massively crampy from the rowing. The new fangled radio controlled clocks had all gone mental and were showing a variety of times none of which tallied with reality so the class started late thus overran all whilst time seemed to be in the past (or somesuch). Anyway it was the usual collection of downward dogging and things I can’t do that are nonetheless doing me good I hope. I can do pigeon stretch which is interesting my bum is the thing that is most dead. Obviously not through lack of flexibility. The inability to various things continued into the evening where Matt made us do some things I’d already done in Jenny’s class in the morning in combination with various shouldery things that I just can’t do due to the way my shoulders are engineered. He then topped it off by making us walk across the floor in a plank position holding on to dumbbells and dragging our feet behind us. I found myself stuck in plank position unable to move in any direction. Fail! Never mind. Another gym day over. On Wednesday I went back to spin after carrying out a small experiment to see if not doing it helped my bum. It didn’t so back I went. Jeff was taking the class. I took it a bit easier than usual as my legs were rather tired after a proper session on Monday. I’m not sure why I bothered as I knew in the evening I was going to go out before the Arena run to make it an LSR, or maybe that is why I did it? Anyhow I did indeed go out beforehand and notched up 5.5 miles before the usual run so it became a 12.5 miler all told. Thursday was back to proper training (for a week at least). We were back to the bottom start now the clocks have changed which means a mix of different hills. This week it was 10 x short hills, 5 x long hills and 8 x green light hills (5 lampposts). Although I wished to do the session properly I was strangely wheezy even though I had inhaled and my bum was playing up a bit so I was possibly not as fast as I could have been. However I still did the session so I would have reaped the benefits of the hills nonetheless. I forgot to start my watch but did around 4 miles altogether. I discovered on Saturday that I have been overtraining (again – surprise) when I attempted to do parkrun and had nothing at all to give. At least I have been sensible and not gone running today. I need to try and have a light week next week as I have Poppy Half next Sunday and there is no point doing it if it is going to be slow and a struggle and make me even more knackered. Come on Isobel! Sensible please.